This amazing visual treat is totally Burton. He takes on the bloody subject of Stephen Sondheim’s brilliant graphic musical dealing with a legendary barber whose lust for revenge lead to the slitting of many throats to get to the man he wanted. 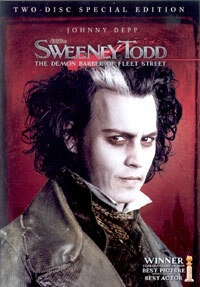 Having been wrongfully (and maliciously incarcerated) our anti-hero returns to a filthy London town as Sweeney Todd, to seek retribution on the judge who had him arrested in order to get to his wife. Slowly Todd reintegrates and reopens his old barbershop in Fleet Street, upstairs from Mrs. Lovett’s pie shop. Their relationship becomes a gruesome partnership whereby the men (not worthy to walk amoung the living) get their throats slit (while sitting down for a shave), their remains disposed of by being recycled as ingredients for Mrs. Lovett’s pies! But, it is all bound to lead to tragedy. Sondheim’s musical elements and integrity remain in tact and are well integrated and executed as a main feature in the story-telling, making this one of the most original and enjoyable musicals of recent years (and probably the only one with fountains of blood!). Johnny Depp and Helena Bonham Carter make a fantastic duo and everything from the set design (real or digital), great songs & music, special-FX, and cinematography combine to serve up an irresistibly dark tale. The double disc release of this award winning movie contains a load of additional material including documentaries on the origin of the story, previous movie renditions, the musical, and Burton’s screen version, as well as many other layers of the production.